The Division of Extended Studies is composed of 4 units: (1) Distance Education/e-Learning, (2) Continuing Education, (3) Summer School, and (4) Special Students. Administrative offices are located in the H.M. Michaux, Jr. School of Education Building, Room 2051, which is geographically off Cecil and Lincoln streets at 712 Cecil Street and across from the NCCU School of Law. Course development and technology support services for distance education/e-Learning faculty and students is located in the Faculty Development Den in Room 128 of the Farrison-Newton Communications Building. Distance education/e-learning instruction uses a variety of pedagogical strategies to meet the educational needs of students separated from faculty and/or resources by time, place, or other circumstances. These strategies include instruction off-campus in the traditional mode face-to- face or through distance learning technologies such as Blackboard, teleconferencing, Podcasting, and other computer-mediated instruction. Continuing Education sponsors activities that are designed for life enrichment and/or for student certification and renewal. It offers courses that may be taken for CEU credit or as non-credit experiences. Institutions, agencies, and individuals are encouraged to contact Extended Studies to arrange a planning session for the development of continuing education activities. North Carolina Central University Summer School is designed to give variety and flexibility to the instructional programs of the University, while providing a quality education. It seeks to give students the opportunity to accelerate progress toward degrees or certificates, to provide opportunities for continued guided research at the graduate level and to allow visiting students the opportunity to take classes while at home during the summer. The Summer Sessions also assist teachers who need credit toward renewal of teaching certificates or advanced degrees and persons in professional fields who wish to keep abreast of new developments and trends. Visiting students who wish to continue at NCCU must be admitted through the regular undergraduate or graduate admission process. Admission to the Summer School does not automatically grant admission as a degree-seeking student. Each non-NCCU student planning to attend NCCU during the summer must notify the Summer School of his or her desire to do so by completing and returning a Summer School application form. North Carolina Central University Distance Education/e-learning instruction is open to all students, especially those restricted by place and time. Students who are not enrolled in an NCCU degree program must be formally admitted for Distance Education or e-learning instruction study. Students must apply to North Carolina Central University (please see “Admissions” section of this catalog). Students not currently enrolled at NCCU should contact Extended Studies for admissions, course offerings, and other applicable information. Distance Education/e-Learning instruction is funded through student credit hours. Tuition/fees are subject to increase each academic year by the fiscal officials of the University. Students should consult Student Accounting for the tuition/fees for the semester or summer session that they plan to attend. Refunds are issued according to University policies. The North Carolina Central University Scholarships and Student Aid Office makes every effort to assist students in the financing of their education through the student financial aid programs. The primary objective of the Scholarships and Student Aid Office is to meet the demonstrated financial need of as many students possible by using a combination of the available funds. To apply for financial aid, students must complete the Free Application for Federal Student Aid (FAFSA) or the Renewal FAFSA. The Renewal allows students to update student aid application data from the prior year. Students are encouraged to apply for financial aid electronically for rapid processing at www.fafsa.ed.gov. Students should make sure the correct award year is selected, and the school code of 002950 is listed in section six. Students who comply with the published deadline for application completion will be awarded first; students who apply late will be awarded if funds are available. Prior to enrollment at the University, all new students should submit to Student Health and Counseling Services a report of their medical history and a copy of an official record of immunization. North Carolina Statue G.S. 130A-155.1 requires persons attending a college or university, whether public, private, or religious, to present a Certificate of Immunization or a record of immunization or high school located in North Carolina. For out-of state students, a Certificate of Immunization or high school immunization record indicated that the person has received immunization is required to attend a college or university in North Carolina. • Students registered only in off-campus courses. • Students attending night or weekend classes only. • Students taking a course load of four (4) credit hours or less and residing off campus. If at any time the above student status changes to on-campus courses load of more than four(4) credit hours, on-campus residence, and/or enrolled in daytime courses, a Certificate of Immunization or record of immunization must be presented on or before the date the person first registers for a quarter or semester. The University reserves the right to discontinue any course, to limit registration in any course, to reschedule any course, and/or to make any other changes in Distance Education/e-Learning Instruction courses or instructors that are deemed necessary. The Faculty Development Den, located in the Farrison-Newton Communications building, offers support services and training for the development and management of online and web-enhanced courses. The Faculty Den and Blackboard Office is responsible for training and managing the BlackboardTM Learning Management System. The Den is equipped with computers and a printer that faculty can use to enhance and develop course materials. Extended Studies has provided a platform for faculty, staff, and students to access many forms of e-learning at NCCU. Online courses are completely web-based and can be accessed via the Internet and make significant use of Internet technology to facilitate access to instructional materials and to support communication between faculty and students, among students, and between students and resources. Web-enhanced courses make use of Internet technology and services to support distribution of class materials such as course syllabi, staff information, bibliographies, course requirements, and resources on the web. Web-enhanced courses remove the dependency on large volumes of handouts. 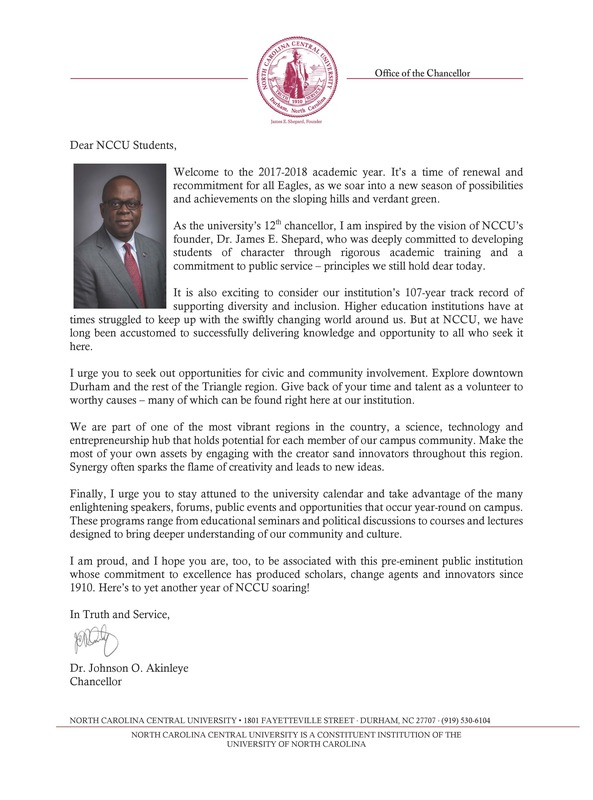 For more information on distance education and e-learning at NCCU, contact the Division of Extended Studies at 919-530-6324. For Blackboard Technical Support, please contact the Blackboard Office at 919-530-7667. Continuing Education offers continuing education units or non-degree credit for activities that include workshops, conferences, seminars, short programs, courses, or other structured educational experiences in which students register by name but receive no college degree credit. These activities are designed for life enrichment. The North Carolina Central University Summer School is open to all student. Students who are not enrolled in an NCCU degree program must be formally admitted for summer-only study through the Summer School Office. High school graduates and selected high school students, undergraduate and graduate students enrolled at other institutions, and individuals interested in courses for personal enrichment or professional advancement may register for summer courses. Students not currently enrolled at NCCU should contact the Summer School Office of the University for an admission application. Tuition and fees are adjusted annually. Students should consult the Summer School website for the exact tuition and fees for the summer session they plan to attend. Refunds are made only to students who officially withdraw by the deadline date listed in the Summer School calendar. Refunds will not be made to students who unofficially withdraw by not attending classes or who are dismissed for disciplinary reasons. The types of financial aid available during the summer are limited to funds remaining in the Pell Grant, Stafford, and PLUS Loans. Students must plan ahead for Summer School by reserving funds to cover these expenses. If students borrow the maximum loan amounts for their classification during the academic year, the students will not have funds available to cover summer school expenses. To qualify for a student or parent loan, students must be enrolled at least on a half-time basis, undergraduates six (6) hours and graduates four and one-half (4.5) hours. If there is a change in class schedule that results in enrollment of less than half-time, the Stafford and/or PLUS loans will be cancelled. The W.G. Pearson Cafeteria offers meal plans, which are valid only during the periods for which they are issued, to students living on or off campus. There will be no refunds for meals missed during the periods indicated nor are refunds made for meals missed because of conflicts with classes. Meal service in other food areas on campus is available on a cash basis to all students. A campus-parking permit is required for all persons who park a motorized vehicle on campus. New students, visiting faculty, and staff who do not pay a parking fee during the regular academic year must purchase a parking permit for their vehicles. The Student Health Service is an outpatient service available to all regularly enrolled students. In emergency cases, students may contact the University Police after these hours. Services include medical consultations, laboratory services, minor surgical procedures, enrolled, and must provide supporting documentation as appropriate. Transcripts from all colleges and universities attended are required if the applicant plans to enter degree-seeking status at a later date. On-campus housing is available in residence halls during both summer sessions. Students should consult the Summer School Bulletin, Residential Life, or the Office of Student Billing/Accounts Receivable for the exact charges in effect for the session they will be attending. New applicants may complete the Free Application for Federal Student Aid (FAFSA) online at www.fafsa.ed.gov. Applicants should record the school code of 002950 for North Carolina Central University in section six of the FAFSA. Applicants must verify that North Carolina Central University is listed on the Student Aid Report (SAR). Students receiving financial assistance for the first time during the summer session should closely monitor the deadline date to ensure that the FAFSA is processed before classes begin. All students are required to submit a Summer School Financial Aid Application for NCCU to receive financial assistance for summer school. Applications will be issued to students and physical therapy. The maximum number of academic credits for which a student may enroll during each summer session is six (6) semester hours. Students who desire to take more than six hours must receive written approval for an overload from the dean of the school or college in which they are enrolled. The academic regulations which govern students during the regular academic year are also applicable to summer school students. (See “Academic Regulations” section of this catalog for information on matriculation, academic progress, grading, class attendance, etc.) The University reserves the right to discontinue any course, to limit registration in any course, to reschedule any course, or make any other changes in Summer School courses or instructors that are deemed necessary. Special students are those who are not candidates for degree at the present time. This category includes 1) visiting students and 2) persons who have not enrolled for one academic year and are ineligible for admissions as a transfer student. The University welcomes into this admission status persons who are pursuing degrees elsewhere or who desire to earn prerequisites for graduate work. Such students may register upon the presentation of a signed statement from the appropriate official of his/her institution or certifying agency specifically listing and approving the courses to be taken. Such enrollment does not constitute regular admission to the University. Visiting students must submit a transient course study form from the home institution that has been approved by the department chairperson, academic dean, and the University Registrar. All others must provide evidence of readiness to pursue the courses desired and a statement of objective and purpose related to the request for special student admission. Special students may register for no more than twelve semester hours. After completing one semester of full-time study, or its equivalent, the unclassified student may petition the Office of Admissions to be admitted to the University as a regular degree seeking student on the basis of their academic accomplishments. SPECIAL NOTE: Designation as unclassified may affect eligibility for veterans’ benefits. Students expecting to apply for veterans’ benefits should contact the Registrar’s Office. Unclassified and special students are ineligible for financial aid. ADMISSION IN THIS CATEGORY DOES NOT AUTOMATICALLY GUARANTEE ADMISSION AS A DEGREE-SEEKING NCCU STUDENT.